Q:What can I do if the powerline adapters do not work automatically by “plug &play”? Q:How do I add a new powerline adapter to an existing powerline network? Q:How do I clone the wi-fi if pressing WPS buttons do not work or there is no WPS button on my router? A:We can manually change the powerline extender’s wireless name and password to be the same as the router through its web interface.For detailed instruction,please refer to FAQ 398. A: For MAC 10.6 or later,we also provide Powerline Utility and Powerline Scan Utility to manage our powerline adapters. For Ubuntu or older versions of MAC, we don’t provide configuration utility for them, please configure the adapters on Windows OS. Or use the pair buttons to pair them and use the web interface to configure our wireless powerline adapters. A: TP-LINK AV200,AV500,AV600 powerline adapters adopte HomePlug AV Standard, so they are compatible with each other,AV1200 adopt HomePlug AV2,that is also backward compatible with HomePlug AV standard,which means TP-LINK AV200,AV500,AV600,AV1200 are all compatible with each other.However, the powerline rate will drop to lowest one’s rate when use different AV adapters together. For adapters of other brands,if they adopt the same standard,they should also be compatible with TP-LINK adapters.However,different brands’ products will have different ways to pair and configure,it might be much easier to use adapters from the same brand. 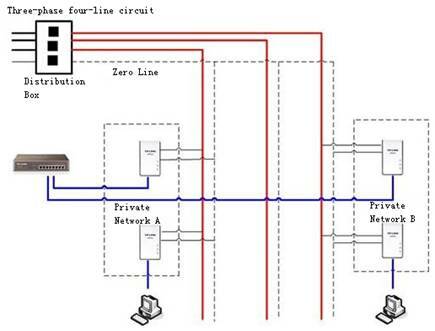 A: Yes.The powerline networks can be separated by different network names. About how to change the network name, it can be made by the pair button or attached Utility. However, the overall throughput is shared by the multiple networks, please be informed of this. Please refer to the FAQ 258 to change the powerline network names. Q: How many PLC adapters can be paired together? Q: Why can not my powerline rate reach 200Mbps , 500Mbps,600Mbps or 1200Mbps? A: 200Mbps , 500Mbps,600Mbps and 1200Mbps are the highest powerline rate in theory. However the power line circuit is very complex, there may be much interference. Electrical equipments with electromotor, like washing machine/air-condition, can generate interference may even cut off your powerline connection. If possible, please avoid such devices. Q:What can I do if my powerline rate is very slow? A: Powerline products transmit data through the power line of your house. The powerline rate is mainly decided by the quality of power line environment.Please refer to this FAQ 409 for suggestions. A: Yes, but its rate will be affected when crossing the phases. For three-phase four-line circuit, we suggest you use the topology below to get good performance. Q: If there are many powerline adapters in the same private network, how will the power line rate be of each device? A: In the same private power line network, all devices share the whole bandwidth. Q: Can TP-LINK powerline adapters work in unstable power line circuit? A: Yes. The voltage range that powerline adapters can work with is 100-240V, the general voltage fluctuation will not affect the stability. A: No. Usually, UPS has filter function. It can cut the powerline connection. Some air-switches or breaker also have the same function. Besides, some power outlets have surge protector function which can also cut the powerline connection. You’d better not plug powerline adapters to outlets. Q: Can Powerline adapters work if they are separated by different electric circuits? A: No. If they can pair in the same room, but the powerline LED turns off when you move one powerline device to another area, this usually means they are plugged into separate electrical circuits, preventing them from communicating. Please try different locations. A: Please refer to FAQ 392 to check your settings. A: Not necessary. Just keep the way that existing adapters/extenders hook up to your old router. If you need to change the wireless settings of the extenders to be the same as the new router’s settings, please press the WPS button on the router and then Wi-Fi button on the adapter; or refer to this link How do I configure the wireless settings on the Powerline Extender if there is no WPS button on my router? Q: Why my powerline adapters interfere with some other devices? A: Since HomePlug AV/AV2 protocol use the same frequency band with some other devices, Powerline products may interfere with devices such as lighting systems that have a dimmer switch or a touch-sensitive on/off feature, short wave radios, cable television system, VDSL devices, speakers, or other Powerline devices that do not follow the HomePlug AV/AV2 standard. A: Please refer to FAQ 882 for answers.